Forgive me, dear friends. I am not reading this to arouse within you some particularly lofty mental pictures to correspond with these washed-out sentences but rather to lead before you a symbol of our time. “A cosmic religiosity is in the process of growing among us, and the extent of the longing for it is shown by the perceptible growth of the theosophical movement that undertakes to discover and unveil the circulation of life behind the senses.” It is indeed difficult to stagger over all these washed-out concepts, but is it not nevertheless true that as a symbol of our time this is quite peculiar? Further on he says, “In this cosmic piety, it is not a question of mysticism that begins with rejection of the world . . .” etc. One cannot conceive of anything clever in these sentences! Since the Professor, Doctor of Theology, and Doctor of Philosophy represents it, however, one must naturally consider it as something clever. Otherwise one would perceive it as something that is brought falteringly to expression in an unclear tirade, reminding one of the learned gentleman who can no longer continue on the path on which he has traveled and who feels obliged to point to something that is there, something that apparently seems to him not completely hopeless. One should not be at all delighted with these utterances; such things must not lull us into slumber just because we notice that from some direction someone has again observed that something lies behind the spiritual scientific movement. That would indeed be very harmful, because those who make these remarks are often the same ones who feel satisfied with such utterances, who do not go further. They even point with these washed-out things to an event that will enter the world, and this would thereby belong precisely to those who are altogether too comfortable to become involved in something that requires earnest study of spiritual science. This event must really break in and take hold of human feeling (Gemuet) if what is bound up with reality is to flow into the time-stream of evolution so that healing forces are able to rise from it. It is naturally easier to speak of the “surging waves” and of “cosmic feelings” than to enter seriously into the things that are demanded by the signs of the time and that must be made known to humanity. For this reason it seems to me necessary to say things here that have been stated previously in public lectures but that will be spoken of further, now with a strong emphasis on the difference between what is worn out, what is no longer capable of life, which has led to these catastrophic times, and what must really take hold of the human soul if any progress is to be made. With the old wisdom by which human beings have reached the present, thousands of congresses can be held — world congresses and national congresses, and whatever — thousands of societies can be founded, but one must be clear that these thousands of congresses, thousands of societies, will not be effective unless the spiritual life-blood of the science of the spirit flows through them. What man is lacking today is the courage to enter into the real exploration of the spiritual world. It sounds strange, but it must be said that all that is needed to begin with is to circulate to a broad public, for example, the small brochure, Human Life in the Light of Spiritual Science. Something new would be achieved through this in calling forth knowledge of man's connection with the cosmic order. Attention is drawn precisely to such knowledge in this brochure. Concrete attention is drawn to the way in which the earth annually alters its conditions of consciousness and the like. What is said in this lecture and in this brochure is said with particularly full consideration of the needs of our time. To receive this would be of greater significance than all the wishy-washy talk of “cosmic feeling” and of entering some sort of “surging waves,” or what have you. I have only quoted these things to you, because to reword them is impossible for me, as they are too senseless in their formulation. One is not hindered, of course, by being attentive to these things, because they are important and essential. What I wish to draw to your attention is that we must not “mystify” ourselves, that we must be clear. Utter clarity is necessary if we wish to work for an anthroposophically oriented spiritual science. I wish to point out once again that what is essential for humanity in this fifth post-Atlantean period is to enter into a special treatment of great issues of life that have been obscured in a certain way through the wisdom of the past. I have already pointed this out to you. One great issue of life can be characterized in the following way: an attempt will have to be made to place the spiritual etheric in the service of outer practical life. I have brought to your attention that the fifth post-Atlantean period will have to solve the problem of how human moods, the motions of human moods, allow themselves to be translated into wave motions on machines, how man must be brought into connection with what must become more and more mechanical. For that reason I called your attention a week ago to how superficially this mechanizing will be accepted by a certain portion of the surface of the earth. I presented an example to show how, following the American way of thinking, an attempt was made to extend the mechanical over human life itself. I presented the example of the pauses that were to be exploited so that, instead of far fewer tons, up to fifty tons could be loaded by a number of workmen. For this one need only carry the Darwinian principle of selection actually into life. In such situations the will is there to harness human energy to mechanical energy. These things should not be treated by fighting against them. That is a completely false view. These things will not fail to appear; they will come. What we are concerned with is whether, in the course of world history, they are entrusted to people who are familiar in a selfless way with the great aims of earthly evolution and who structure these things for the health of human beings or whether they are enacted by groups of human beings who exploit these things in an egotistical or in a group-egotistical sense. That is what matters. It is not a question of the what in this case; the what is sure to come. It is a question of the how, how one tackles these situations. The what lies simply in the meaning of earthly evolution. The welding together of the human nature with the mechanical nature will be a problem of great significance for the remainder of earthly evolution. I have deliberately drawn attention often, even in public lectures, to the fact that the consciousness of the human being is connected with the forces of disintegration. On two occasions I have said in public lectures in Basel that within our nervous system we are dying. These forces, these forces of dying away, will become more and more powerful. The bond will be established between these forces dying within man, which are related to the electric, magnetic forces, and the outer mechanical forces. Man will to a certain extent become his intentions, he will be able to direct his thoughts into the mechanical forces. Hitherto undiscovered forces within human nature will be discovered, forces that will work on outer electric and magnetic forces. The first problem is to bring together human beings with the mechanical, which will have to prevail increasingly in the future. The second problem consists in calling upon the help of the spiritual circumstances. This can only be done, however, when the time is ripe and when a sufficient number of people are prepared for it in the right way. The time must come, however, when the spiritual forces are made mobile enough to master life in relation to illness and death. Medicine will become spiritualized, intensely spiritualized. Of all these things, caricatures are being made from certain directions, but these caricatures show only what really must come. Again it is a question of whether this problem is attacked from the same direction to which I pointed regarding the other problem, in an outer egotistical or group-egotistical way. The third problem is to introduce human thoughts into the actual evolution of the human species, in birth and education. I have pointed out that conferences have already been held on how in the future a materialistic science would be founded regarding conception and the relationships between man and woman. All these things indicate to us that something most significant is in the process of evolving. It is still easy today to say, “Why is it that people who know about these things in the right sense do not apply them?” In the future it will become clear just what is involved in this application and which forces are still actively hindering the foundation of large-scale spiritualized medicine or spiritualized national economy. No more can be accomplished today than to talk about these things, until people have enough understanding of them, people who are inclined to accept them in a selfless way. Today many people believe that they are able to do this, but many circumstances of life hinder what they are able to do. These life circumstances can be overcome in the right way only when a deeper and deeper understanding gains ground and when there is willingness to renounce, at least for a time, the immediate, practical application of these things on a larger scale. These things have all developed in such a way that one can say that little has been retained of what was once hidden behind the ancient, atavistic strivings until the fourteenth and fifteenth centuries. There is much talk today about the ancient alchemy. The proceedings of the procreation of Homunculus are also recalled at times, and so on, but what is spoken of here is for the most part groundless. If one once understood what can be said in connection with the Homunculus scene in Goethe's Faust, one would be better informed about these things, because what is essential is that, from the sixteenth century on, a fog has been spread over these things; they have receded in human consciousness. The law that governs these things is the same as the law that regulates within the human being the rhythmical alternation of waking and sleeping. Just as man cannot rise above sleep, so, in regard to spiritual evolution, he cannot disregard the sleeping of spiritual science that has marked the centuries since the sixteenth century. It was necessary for humanity to sleep through the spiritual for a time in order that it could appear again in another form. One must comprehend such necessities, but one must also not allow oneself to be depressed by them. For this reason one must be very clear that the time of awakening has come and that one must take an active part in this awakening, that events often hurry ahead of knowledge and one will not understand the events that take place around us unless one accustoms oneself to knowledge. I have repeatedly pointed out to you that certain egotistical groups are striving esoterically, and their influence is active in the ways that I have often indicated in these studies. First of all, it was necessary that a certain knowledge should recede within humanity, a knowledge that is designated today with such misunderstood words as alchemy, astrology, and so on. This knowledge had to recede, fall into a sleep, so that man would no longer have the possibility of drawing what pertains to the soul out of observation of nature but would have to become more dependent on himself. Through this he would awaken the forces within him, for it was necessary that certain things appear first in abstract form and later take on again concrete, spiritual form. Three ideas have gradually arisen in the course of evolving during the last centuries, ideas which, in the way they have entered human life, are essentially abstract. Kant has named them falsely, while Goethe has named them correctly. These three ideas Kant called God, freedom, and immortality; Goethe called them correctly God, virtue, and immortality. When one sees the things that are hidden behind these three words, it is clear that they are exactly the same as what modern man views more abstractly but that were viewed more concretely until the fourteenth and fifteenth centuries. In the ancient atavistic sense they were also viewed more materially. They experimented in the ancient way, indeed, they sought at that time with alchemical experiments to observe the processes that showed the working of God in process. They tried to produce the Philosopher's Stone. Behind all these things is hidden something concrete. This Philosopher's Stone was to present human beings with the possibility of becoming virtuous, but it was thought of more materially. It was to lead human beings to experience immortality, to put them into a certain relationship to the universe, through which they would experience within themselves what goes beyond birth and death. All these washed out ideas with which one seeks today to grasp the ancient things no longer coincide with what was intended at that time. These things have become simply abstract, and modern humanity speaks from abstract ideas. They have wished to understand God through abstract theology; virtue is also regarded as something purely abstract. The more abstract the idea, the better modern humanity likes to use it in speaking about these things, even immortality. One speculates about what could be immortal in man. I spoke about this in my first Basel lecture, saying that the science that occupies itself today philosophically with questions about immortality is a starved science, an undernourished science. This is only another form of expression for abstract thinking in which such matters are pursued. Certain brotherhoods in the West, however, have still preserved a relationship to the old traditions and have tried to apply them in a corresponding way, to place them in the service of a certain group egoism. It is really necessary for these things to be pointed out. Naturally, when these things are spoken of in public, from this comer of the West, in exoteric literature, then God, virtue or freedom, and immortality are also talked about in an abstract way. It is only in the circle of the initiates that it is known that all of this is only speculation, that these are all abstractions. For themselves, they seek what is being striven for in the abstract formulas of God, virtue, and immortality in something much more concrete, and for this reason, these words are translated for the initiates in their respective schools. God is translated as gold, and one seeks behind the mystery to come to what can be described as the mystery of gold. Gold, representing what is sun-like within the earth's crust, is indeed something within which is imbedded a most significant mystery. In fact, gold stands materially in the same relationship to other substances as within thinking the thought of God stands to other thoughts. It only matters in which way this mystery is understood. This relates to the egotistical group exploitation of the mystery of birth. One is striving to wrestle here with real cosmic understanding. Modern man has completely replaced this cosmic understanding with a terrestrial understanding. When man today wishes to examine, for example, how the embryo in animals and man develops, he examines with a microscope what exists precisely in the place on earth onto which he has cast his microscopic eye; he regards this as what is to be examined. It cannot be a matter only of this, however. It will be discovered — and certain circles are coming close to this in their discoveries — that the active forces are not in what one meets with the microscopic eye but are rather within what streams in from the cosmos, from the constellations in the cosmos. When an embryo arises, it arises because into the living being in which the embryo is being formed are working forces from all directions of the cosmos, cosmic forces. When a fertilization takes place, what will develop out of the fertilization is dependent upon which cosmic forces are active. There is one thing that will come to be understood today that is not yet understood. Today one looks at some living being, let us say a chicken. When in this living being a new embryo arises, the biologist examines how, so to speak, out of this chicken the egg grows. He examines the forces that are supposed to allow the egg to grow out of the chicken. This is a piece of nonsense. The egg does not at all grow out of the hen; the hen is only the foundation; the forces work out of the cosmos, forces that produce the egg on the ground that has been prepared within the hen. 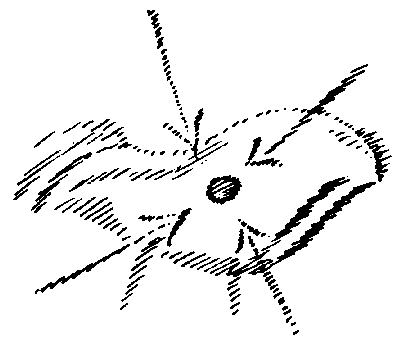 When the biologist today works with his microscope, he believes that what he sees in the microscopic field also includes the forces on which what he sees depends. What he sees there, however, is subject to the forces of the stars that work together in a certain constellation, and when one discovers the cosmic here, one will discover the truth, the reality: it is the universe that conjures the egg from the hen. All of this, however, is connected above all with the mystery of the sun and, observed from the earth, with the mystery of gold. Today I am offering a kind of programmatic indication; in the course of time these things will become clearer. In the same schools about which we are speaking, virtue is not called virtue but is simply called health, and one endeavors to acquaint oneself with those cosmic constellations that have a connection with the health and illness of human beings. Through acquainting oneself with the cosmic constellations, however, one learns to know the individual substances that lie on the surface of the earth, the juices and so on, that are connected with health and illness. From certain directions, a more material form of the science of health is increasingly being developed, one that rests, however, on a spiritual foundation. The notion will also spread from this direction that man becomes good not by learning all sorts of ethical principles, through which man can become good, but rather by, let us say, taking copper under a certain constellation of stars or arsenic under another. You can imagine how these things could be exploited for power by groups of egotistically inclined people. It is only necessary to withhold this knowledge from others who are then unable to participate, and one has the best method of ruling over great masses of people. One does not need to speak about these things at all; one need only introduce, for example, some new delicacy. Then one can seek a market for this new delicacy, which has been tinged appropriately, and thus bring about what is necessary, if these things are comprehended materialistically. One must be clear that in all matter there are hidden spiritual workings. Only one who knows in the true sense that there is nothing really material but only the spiritual will penetrate beyond the mysteries of life. Likewise, the attempt will be made from this direction to bring the problem of immortality into materialistic channels. This problem of immortality can be led into materialistic channels in the same way, by exploitation of cosmic constellations. One does not, of course, attain through this what is often speculated as being immortality, but one attains a different immortality. One prepares oneself — so long as it is impossible to influence the physical body to prolong life artificially — to undergo soul experiences that will enable one to remain in the lodge of a brotherhood even after death, to help there with the forces that one has at one's disposal. Immortality is simply called prolonging life in these circles. You can see outer signs of all these things. I do not know whether some of you have noticed the book that for a time provoked a sensation, a book that also came from the West bearing the title, The Disturbance of Dying (Der Unfug des Sterbens). These things all move in this direction. They are only the beginning. What has gone further than the beginning is carefully preserved for the group egotism, is kept very esoteric. These things are actually possible, however, if one brings them into materialistic channels, if one makes the abstract ideas of God, virtue, and immortality into concrete ideas of gold, health, and prolonging life, if one exploits in a group-egotistical sense what I presented to you as the great problems of the fifth post-Atlantean times. What is called in a washed-out way “cosmic feeling” by Professor, Doctor of Theology, Doctor of Philosophy, is presented by many — and unfortunately by many in an egotistical sense — as cosmic knowledge. While science for centuries has beheld only processes occurring on earth, has rejected all study of what is approaching as the most important extraterrestrial occurrence, it will be precisely in the fifth post-Atlantean time that exploitation will be considered of the forces penetrating in from the cosmos. Just as it is now of special importance for the regular professor of biology possibly to have a much-enlarged microscope, possibly to use much more exact laboratory methods, so in the future, when science has become spiritualized, what will matter will be whether one carries out a certain process in the morning, evening, or at noon, or whether one allows what one did in the morning to be somehow further influenced by active factors of the evening, or whether the cosmic influence from morning until evening is excluded, paralyzed. In the future such processes will prove themselves to be necessary; they also will take place. Naturally much water will run over the dam until the materialistically oriented university chairs, laboratories, and so on, are handed over to the spiritual scientists, but this exchange must take place if humanity is not to come completely into decadence. This laboratory work will have to be replaced by work in which, for example — when it is a matter of the good that is to be attained in the future — certain processes take place in the morning and are interrupted during the day; the cosmic stream passes through them again in the evening, and this is preserved rhythmically until it is morning again. The processes are conducted in such a manner that certain cosmic workings are always interrupted during the day, and the cosmic processes of morning and evening are studied. To achieve this, manifold arrangements will be necessary. You can gather from this that when one is not in a position to participate publicly in what happens, one can only talk about these things. From the same direction that wishes to put gold, health, and prolonging life in place of God, virtue, and immortality, the effort is made not to work with the processes of morning and evening but with something totally different. I called to your attention last time that the impulse of the Mystery of Golgotha was to be eliminated from the world by introducing another impulse from the West, a kind of Antichrist; from the direction of the East, the Christ impulse, as it appears in the twentieth century, is to be paralyzed by directing the attention, the interest, away from Christ appearing in the etheric. Those concerned with introducing the Antichrist instead of the Christ have endeavored to exploit what could work especially through the most materialistic forces, yet working spiritually with these materialistic forces. Above all they strive to exploit electricity and especially the earth's magnetism to have influence over the entire earth. I have shown you how, in what I have called the human double, earthly forces arise. This mystery will be penetrated. It will be an American mystery to make use of the magnetism of the earth in its “doubleness,” to make use of the magnetism in North and South to send guiding forces that work spiritually across the earth. Look at the magnetic map of the earth and compare it with what I am now saying. Observe the course of the line where the magnetic needle swings to East and West and where it does not swing at all. (I can only give indications at this time.) From a certain celestial direction, spiritual beings are constantly at work. One need only put these spiritual beings at the service of earthly existence and, because these spiritual beings working in from the cosmos are able to transmit the mystery of the earth's magnetism, one can penetrate the mystery of the earth's magnetism and can bring about something very significant of a group-egotistical nature in relation to the three things, gold, health, and prolonging life. It will simply be a matter of mustering the doubtful courage for these things. This will certainly be done within certain circles! From the direction of the East, it is a matter of strengthening what I have already explained: the in-streaming and actively working beings from the opposing sides of the cosmos are placed at the service of earthly existence. A great struggle will arise in the future. Human science will move toward the cosmic. Human science will attempt to move toward the cosmic but in different ways. It will be the task of the good, healing science to find certain cosmic forces that, through the working together of two cosmic streams, are able to arise on the earth. These two cosmic streams will be those of Pisces and Virgo. It will be most important to discover the mystery of how what works out of the cosmos in the direction of Pisces as a force of the sun combines with what works in the direction of Virgo. The good will be that one will discover how, from the two directions of the cosmos, morning and evening forces can be placed at the service of humanity: on the one side from the direction of Pisces and on the other side from the direction of Virgo. Those who seek to achieve everything through the dualism of polarity, through positive and negative forces, will not concern themselves with these forces. The spiritual mysteries that allow the spirituality to stream forth from the cosmos — with help from the twofold forces of magnetism, from the positive and negative — emerge in the universe from Gemini; these are the forces of midday. It was known already in antiquity that this had something to do with the cosmos, and it is known even today by exoteric scientists that, behind Gemini in the Zodiac, positive and negative magnetism are hidden in some way. An attempt will be made to paralyze what is to be won through the revelation of the duality in the cosmos, to paralyze it in a materialistic, egotistical way through the forces that stream toward humanity especially from Gemini and can be put completely at the service of the double. With other brotherhoods, which above all wish to bypass the Mystery of Golgotha, it is a matter of exploiting the twofold nature of the human being. This twofold nature of the human being, which has entered the fifth post-Atlantean period just as man did, contains the human being but also, within the human being, the lower animal nature. Man is to a certain extent really a centaur; he contains this lower, bestial, astral nature. His humanity is somehow mounted upon this astral beast. Through this cooperation of the twofold nature within the human being there is also a dualism of forces. It is this dualism of forces that will be used more by the egotistical brotherhoods of the Eastern, Indian stream in order also to mislead Eastern Europe, which has the task of preparing the sixth post-Atlantean period. For this, forces from Sagittarius are put to use. The question standing before humanity is whether to master for itself the forces of the cosmos in a doubly wrong way or simply to master them in the right way. This will give a real renewal to astrology, which was atavistic in its ancient form and would not be able to continue in this form. There will be a struggle among the knowledgeable ones in the cosmos. Some will bring about the use of the morning and evening processes, as I indicated; in the West, the midday process will be preferable, excluding the morning and evening processes; and in the East the midnight processes will be used. Substances will no longer be prepared according to forces of chemical attraction and repulsion; it will be known that different substances will be produced depending upon whether they are prepared with morning and evening processes or with midday or midnight processes. It will be known that such substances work in a totally different way upon the three-foldness of God, virtue, and immortality — gold, health, and prolonging life. From the cooperation of what comes from Pisces and Virgo one will not be able to bring about anything harmful. Through this one will achieve what in a certain sense loosens the mechanism of life from the human being but will in no way found any form of rulership and power of one group over another. The cosmic forces that are called forth from this direction will beget strange machines but only ones that will relieve the human being from work, because they will have within them a certain force of intelligence. A cosmically oriented spiritual science will have to concern itself so that all the great temptations that will emanate from these mechanized beasts, which man creates himself, will not exert a harmful influence upon the human being. To all of this the following must be added: it is necessary for human beings to prepare themselves by not taking realities for illusions, really entering into a spiritual conception of the world, into a spiritual comprehension of the world. What is important is to see things as they are. One can only see things as they are, however, when one is in the position of applying to reality the concepts, the ideas, that emerge from an anthroposophically oriented spiritual science. The dead will actively participate for the remainder of earthly existence. How they will participate is what matters. Here, above all, the great distinction will appear. Through man's conduct on earth, the participation of the dead will be guided from a good direction in such a way that the impulses of the dead to work will be able to originate from themselves, impulses taken from the spiritual world that the dead are experiencing after death. Opposing this will be many endeavors to lead the dead in an artificial way into human existence. By the circuitous route through Gemini, the dead will be led into human life in such a way that human vibrations will reverberate in a definite way, will continue to vibrate within the mechanical performance of the machine. The cosmos will bring motion to the machines through the circuitous route that I have just indicated. For that reason, it is important that nothing inappropriate be applied when these problems appear; only elementary forces that are part of nature should be applied. One will have to renounce introducing inappropriate forces into mechanical life. From the occult sphere one must refuse to harness human beings themselves into mechanical factory work, a practice through which the Darwinian theory of selection is used for the determination of the work force, as I presented to you as an example last time. I make all these suggestions, which naturally cannot exhaust the subject in such a short time, because I think that you will meditate further upon these things, that you will seek to build a bridge between your own life experiences and these things, above all those life experiences that can be won today in these difficult times. You will see how many things will become clear to you when you observe them in the light that can come to you through such ideas. In our time, we are not really concerned with forces and constellations of forces confronting one another, the sorts of things about which one is constantly speaking in outer, exoteric life, but with entirely different things. Some intend actually to cast a kind of veil over the true impulses that are involved. There are bound to be certain human forces at work to save something for themselves. What is there to be saved? Certain human forces are at work to defend impulses that were justified until the French Revolution and were even defended by certain esoteric schools; they are being defended now in the form of an Ahrimanic/Luciferic retardation, being defended so as to maintain a social order that humanity believes has been overcome since the end of the eighteenth century. There are mainly two powers that stand in opposition to each other: the representatives of the principle that was overcome at the end of the eighteenth century and the representatives of the new age. It is quite clear that a large number of people instinctively are representatives of the impulses of the new era. The representatives of the old impulses — still of the eighteenth, seventeenth, sixteenth centuries — must therefore be harnessed to these forces by artificial means, to forces emanating from certain group-egotistical brotherhoods. The most effective principle in the new age to extend power over as many people as one needs is the economic principle, the principle of economic dependency. That is only the tool, however. What is involved here is something entirely different. What is involved is something that you can deduce from all my suggestions. The economic principle is bound up with all that is involved in making a large number of human beings from all over the earth into an army for these principles. These are the things that oppose each other. The one points essentially to what is fighting at present in the world: in the West, a rigid, ironclad principle of the eighteenth, seventeenth, sixteenth centuries, which makes itself noticeable by clothing itself in the phrases of revolution, the phrases of democracy, a principle that assumes a mask and has the urge to gain in this way as much power as possible. It helps this endeavor when as few people as possible exert themselves to see things as they are, when they allow themselves to be lulled to sleep again and again in this realm by maya, by the maya that one can express with these words: there is a war today between the Entente and the Central Powers. There is nothing at all like this in reality. We are concerned here with entirely different things that exist behind this maya as the true realities. The struggle between the Entente and the Central Powers is only maya, is only illusion. One can see what stands side by side in the struggle if one looks behind these things, illuminating them in the way that I, for certain reasons, have only suggested. One must at least endeavor not to accept illusions for realities, because then the illusion will gradually dissolve, in so far as it must be dissolved. One must endeavor today above all to consider the things as they present themselves to truly unprejudiced thinking. If you consider in a coherent way all that I have developed here, then a seemingly incidental remark that I made in the course of these lectures will not seem to you to be merely incidental. When I quoted a certain remark that Mephistopheles made in confronting Faust, “I see that you know the devil” — he would definitely not have said this about Woodrow Wilson — it was no incidental remark. It is something that should illuminate the situation! One must really study these things without antipathy and sympathy; one must be able to study them objectively. One must be able above all to reflect today about the significance of constellations in something that is at work and the significance of individual strength, because behind individual strength often lies something completely different from what lies behind the mere constellation. Think for a moment upon the problem, “How much would Woodrow Wilson's brain be worth if this brain were not sitting in the Presidential chair of the United States?” Assume that this brain were in a different constellation: there it would show its individual strength! It all depends upon the constellation. I will now speak abstractly and radically — I will not, of course, characterize the aforementioned case; it would never occur to me to do that in such a neutral country — but independent of that there is a very important insight in relation to the question, for example, about the brain. Does it have value because it is actually illuminated and made active by a particular spiritual soul force — does it thereby have a spiritual weight in the sense that I have spoken in these studies of spiritual weight — or does this brain actually have no more value than would show if one laid it on a scale and on the other side placed a weight? In the moment in which one penetrates beyond the mysteries I presented to you last time concerning the double, one arrives at the point (and I am not speaking of something unreal) of bringing value to the brain, which before had value only as a mass on the scale, because one is capable, if the brain is to be revived, of allowing it to be revived merely by the double. All these things strike human beings today as being grotesque. What seems to them grotesque, however, must come to be something self-evident if these things are to flow into a healthy stream from an unhealthy one. And what use is it if one only chatters about them constantly? You must accept the idea that all this wishy-washy talk about “cosmic religiosity” or “the extent of the longing for it” or “the movement that undertakes to discover and unveil the circulation of life behind the senses,” and so on, does nothing but spread a fog over things that must come into the world only in clarity. They can be effective only in clarity, and they must be carried in clarity above all as practical, moral-ethical impulses in humanity. I can only make single suggestions. I leave it to your own meditation to build on these realms further. 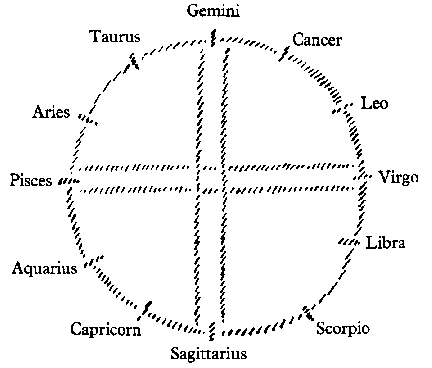 These things are in many respects aphoristic, but you will have the possibility of gathering a great deal from such a summary as this picture of the Zodiac if you truly use it as the substance of meditation.